Mackay's army crosses into hostile territory from the left. Barry Hilton - This scenario was constructed around the core of Mackay's and Dundee's armies at Killiecrankie. I wanted to give the players a chance to experience the extreme terrain of the Highlands and the novelty of dealing with Highlanders. 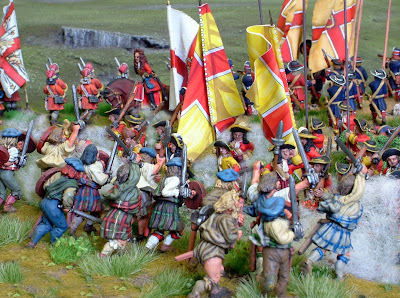 As Jim Masson was attending the weekend and he had been very creative with his use of Warfare Miniatures in his Jacobite Scots army I looked for an opportunity to roster Jim's fine collection in the orbat. This table was the smallest of the four games at 8 x 6 feet. It was dominated by an enormous steep hillside which quartered all movement up and down and disordered any units on the slope. In the end it created a formidable physical obstacle which was to prove very difficult for both sides during each game. The swift running Highland river was passable only at the bridge and at a ford further upstream. The small village was classed as a 1B settlement with a garrison comprising a detachment of Jacobite grenadiers. On the steep back slope of the hill Purcell's Irish Brigade was positioned out of sight and not placed on the table. In the woods either side of the table two clans were concealed on Mackay's right and one on his left. The Williamites diced each turn from T1 to determine whether they spotted movement in each location although the players had no idea why they were dicing! The score needed started at 12 on 2 x D6 on T1 reducing by 1 per turn unless the Jacobite commander voluntarily decided to move the clans who would then become immediately visible. Concealed movement of Purcell's brigade was communicated to and tracked by the umpire. The scenario was predicated on Mackay trying to finish Jacobite resistance in Scotland and the Jacobites attempting to lure Mackay into a trap and massacre his force. Mackay began games 1-3 with his own brigade on the hostile side of the river and his cavalry half across and forming up. In the first three games Mackay's brigade needed to take out the grenadiers in the village in order to clear ground for an attack. The garrison performed very well in all games although in each they were destroyed or routed. The disruption caused by a single stand unit as a garrison was impressive. The Highlanders were unpredictable. They charged several times. Ramsay's withstood a charge and broke the Cameron's in combat in one game. 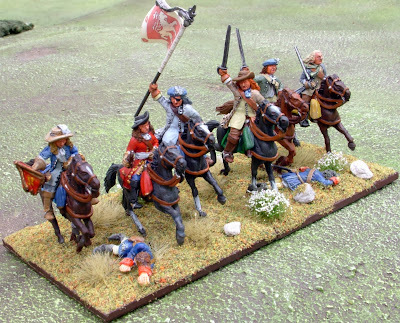 They volleyed off a charge by Clanranald in another game. The most spectacular success they achieved was when the Stewarts of Appin braved a volley and smashed into Hasting's Regiment in game 3. They cut down and destroyed the Englishmen and caused a real stutter in the Williamite advance. I believe Adam Hayes commanded the Jacobites in this game and Gerry may have been the Williamite general. The Horse on both sides were not hugely effective. The regiment of Huguenot cavalry did, during the first game manage to execute a flanking manoeuvre and make it to the top of the hill only to be driven away by volleys from the up until that point hidden Irish Brigade. The Williamite force gained victory in in game 1 by comtrolling the battlefield and manoeuvring the Jacobites into a strategic withdrawal. Game 2 saw the Williamite attack checkmated by poor dice throws and cards. 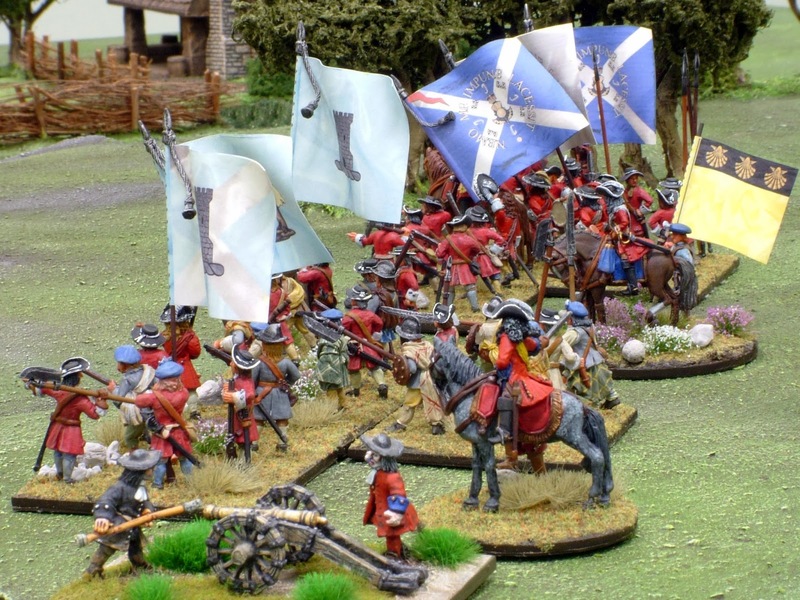 Game 3 was judged a Jacobite win and Game 4 a Williamite one. On the final run of the game as we were a little pushed for time we began with the English Brigade atop the plateau and facing both Dumbarton's and Purcell's brigades whilst the Highlanders attacked Mackay's brigade in the valley. The village was already assumed to have fallen to the Williamites by then. Players commented that this was a particularly tricky scenario. The terrain was frustrating, the Highlanders were a problem for both their own side and the enemy.